Close your eyes and imagine every muscle in your body relaxing deeply and letting go of the day’s stresses and tensions. 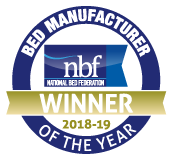 In fact, what you’ve just imagined is the experience of what it’s like to sink into the pocket sprung comfort of a luxury handmade mattress by Millbrook Beds. Our mattresses are deep in comfort. This is owing to the depth of layer-upon-layer of pocket springs that are individually nested to enable them to provide the kind of support that responds to the unique shape and curves of your neck and spine. Our mattresses are also deep in pillowy softness. This is owing to the sumptuous layers of luxury fillings that together create a sleeping surface capable of #perfectsleep. Silk, cashmere, Hampshire wool, pashmina, bamboo and fine English cotton are some of the fine natural fillings we use to create mattresses that are not offer superior comfort, but are carefully chosen for their quality, durability and breathability. So now you can dream deep with the kind of dreamy comfort of mattresses handmade with a deep commitment to quality and craftsmanship.